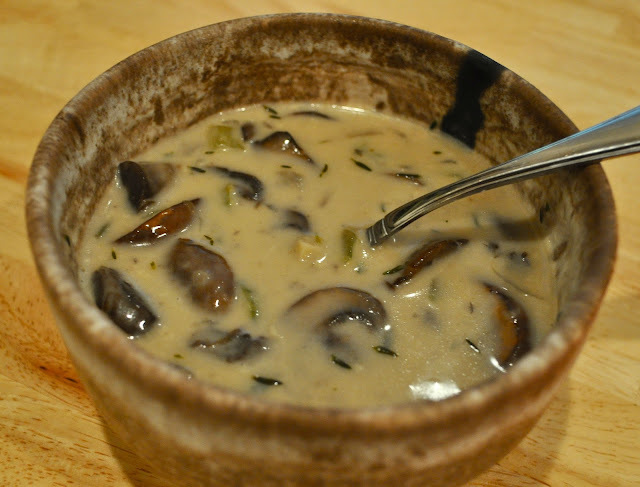 I'm enjoying a big bowl of delicious homemade mushroom soup on this blustery day. I'm thankful for strong stone walls, which keep out the wind, and a little girl who got into the snow day spirit and slept late. Glorious! She is currently in baby-walking boot camp. 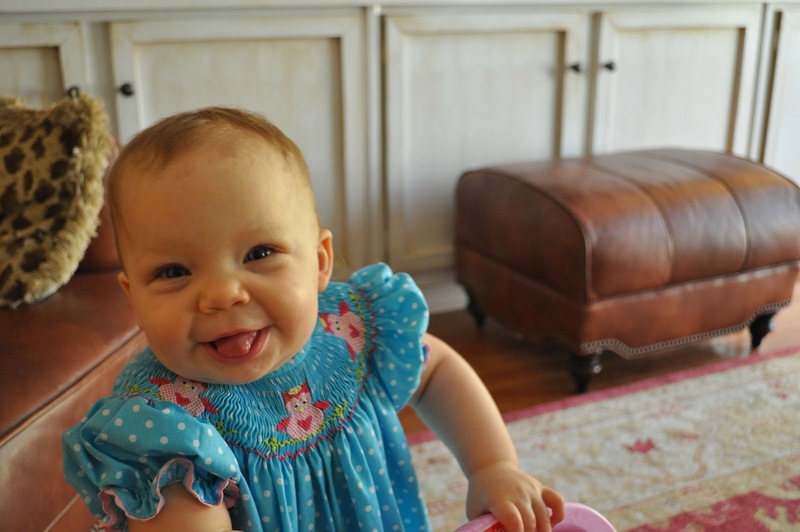 I am DYING for this 13 month old to walk in time for Easter egg hunts. I mean, she says it's fine, and that she will just push her little stroller around and use it to carry eggs. I walk around holding her little hand constantly. 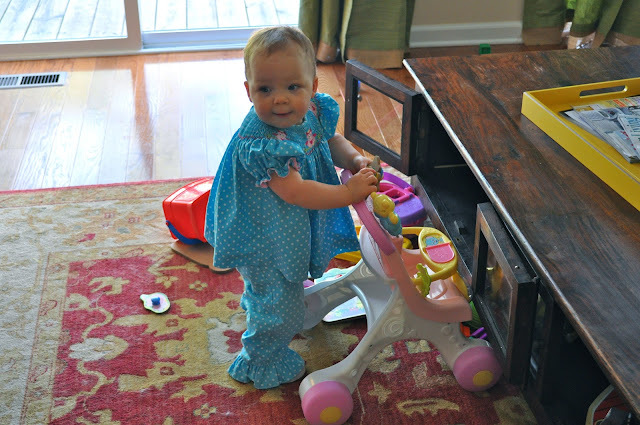 Then she decides it's too slow, and zooms off crawling at top speed. So back to the mushroom soup- recipe is adapted from Taste of the South Comfort Food. Are y'all sick of me talking about this magazine yet? Have you bought it? Anyway, this creamy portobello bisque ain't no Campbells. It is seriously tasty- rich and earthy. 1. In a dutch oven, heat the butter and olive oil over medium heat until the butter is melted. Add the onion and celery and cook for 5 minutes. Add the garlic and thyme and cook for another couple of minutes. 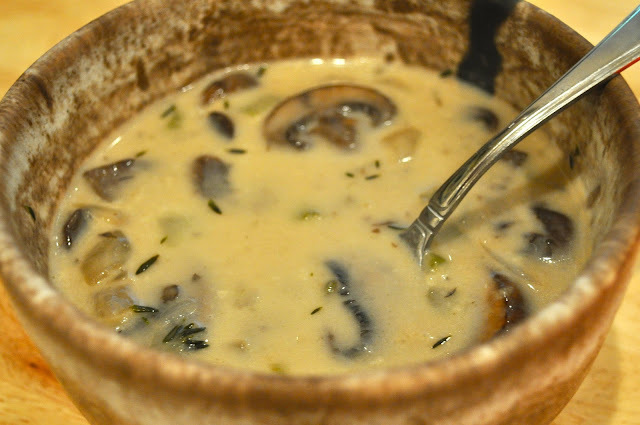 Add the mushrooms and cook for 15 minutes, stirring frequently. Add the flour, salt and pepper, and cook for 2 minutes stirring constantly. Gradually whisk in the chicken broth, whisking until smooth. 2. Bring to a simmer, cook for 20 minute, stirring occasionally. Add cream and cook for 15 minutes. This soup looks awesome - I just pinned it! We had a snowy day in Asheville today too. I just made up some soup - I hope it turns out. Dying over that adorable smile AND outfit! that soup looks amazing!! But i'm distracted by cutie's little outfit and happy smile!! Hope she makes the walking in time - 20 days to go pre-Easter - eee! The walking thing might happen in time! 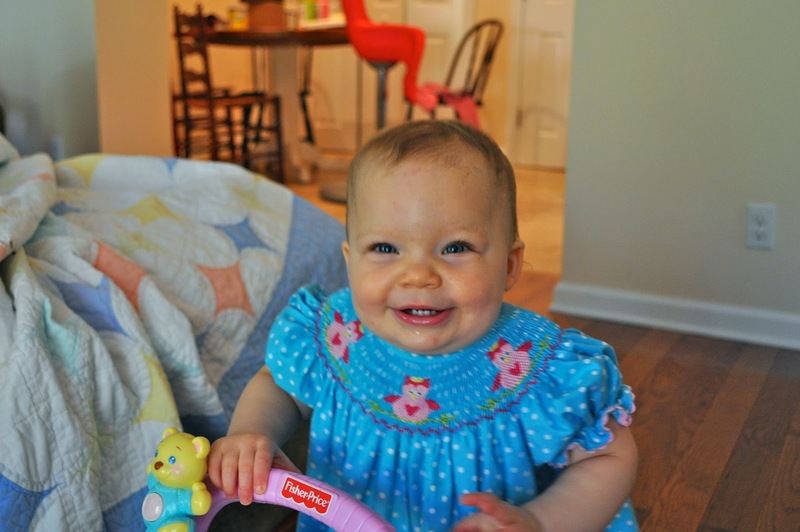 Quinn went from taking 8-10 steps before falling/deciding crawling was faster to walking overnight. It happened this past Friday. He insists on walking all on his own and gets pretty ticked if you try to hurry him. Boy's got sass for sure. Your soup looks delicious! A winner? My husband's side of the family does a big soup dinner for our Christmas gathering. Everyone brings a big crockpot of soup and a bread to go with (6 different soups!). It been kinda fun to find a new recipe to try every year. I'm thinking I may go with your recipe. How many does this serve? Have you ever doubled it without any problems? How about making it the night before... good idea with this soup or not so much?